91% of consumers regularly or occasionally read online reviews prior to visiting a business. So, are reviews hugely influencing? Yes. But how do you control online reviews when 96% of the time they are created after a customer has left your business? There are hundreds of ways increasing reviews can be implemented, from door stickers to social media shoutouts. But, Beambox has 2 features that will automate reviews easily and consistently. Your Beambox WiFi login gives you the flexibility to make your WiFi work for you. One way we do this is by providing an option to redirect your customers to a website of choice once they have logged in. Click "Show a Custom URL" and enter your URL. 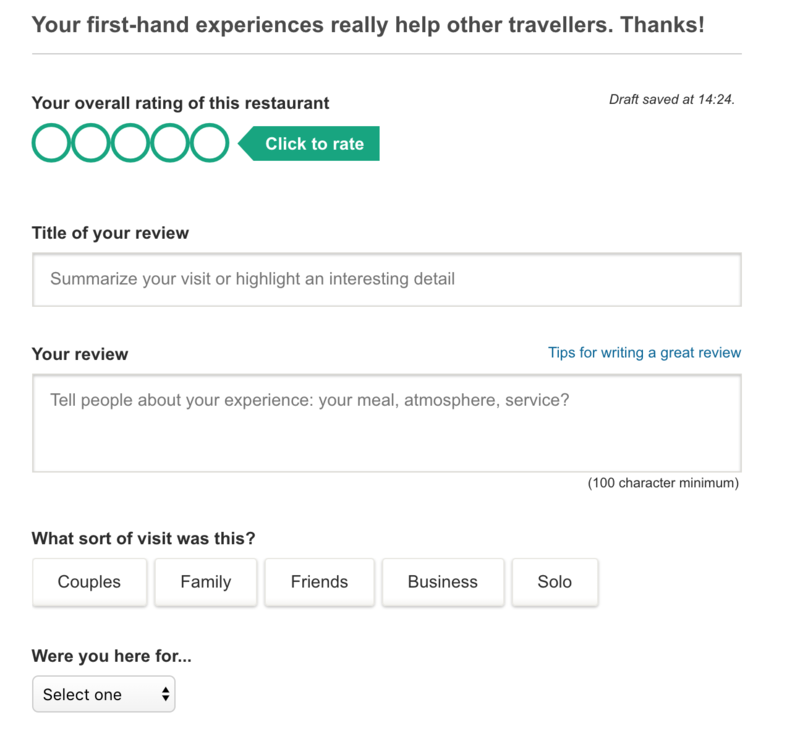 You can find your Tripadvisor URL by heading to your Tripadvisor page and selecting "Write a Review", then just copy the URL from your browser. One cool feature of Beambox is that you can set-up Interactions. Interactions are pre-set emails that send when a customer meets certain criteria. For example, we can make it so that 1 day after a customer visits for the first time (and connects to WiFi!) they receive an email. 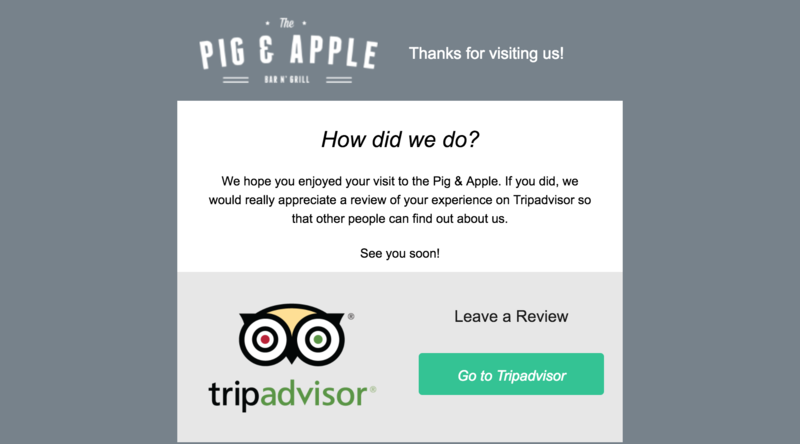 In this email, we can then thank the customer for visiting and also use the opportunity to prompt them for a review. This additionally gives us a chance to capture negative feedback before it hits the web! Setup your Interaction. Create a subject line and set the "from name" and "from email" that will be shown to recipients. You can come back and change these settings at any time. Select your Recipe. A recipe is the criteria that a customer must meet to receive the email. There are some pre-sets on the left-hand-side, or you can specify your own criteria on the right-hand-side. In this example, we will want our customers to have exactly 1 visit and they must have logged in exactly 1 day ago. Design your Email. Our click and drop email designer gives you complete control over the look, feel and function of your email. We recommend keeping it clean, include the TripAdvisor logo and make sure the button link is prominent. Now, you can send a test email and activate your Interaction. Every day Beambox will scan your database for customers who meet the critera and send them the email you designed. Every customer who visits your business for the first time will receive an email prompting them for their feedback and reviews. If you have 500 WiFi users a month and just 10% of them engage with your email and leave a review, that's an additional 50 reviews a month to promote your awareness and increase local exposure. Enjoy the article? Give it a share! Quickly deploy a powerful guest WiFi login across your existing UniFi network with the Beambox cloud controller integration. 87% of diners have picked a restaurant based on its online reviews, here's how you can grow your online reviews on autopilot. This month sees the relaunch of our insights platform, behavioural email sending by the hour and some upgrades to your guest network.